Samarinda (ANTARA East Kalimantan) - An independent non-profit working for the protection of forest and wildlife, Protection of Forest & Fauna (PROFAUNA), declared their appreciation for Tanjung Redeb Police Department's success in forestalling a smuggling attempt of 4,600 sea turtle eggs. 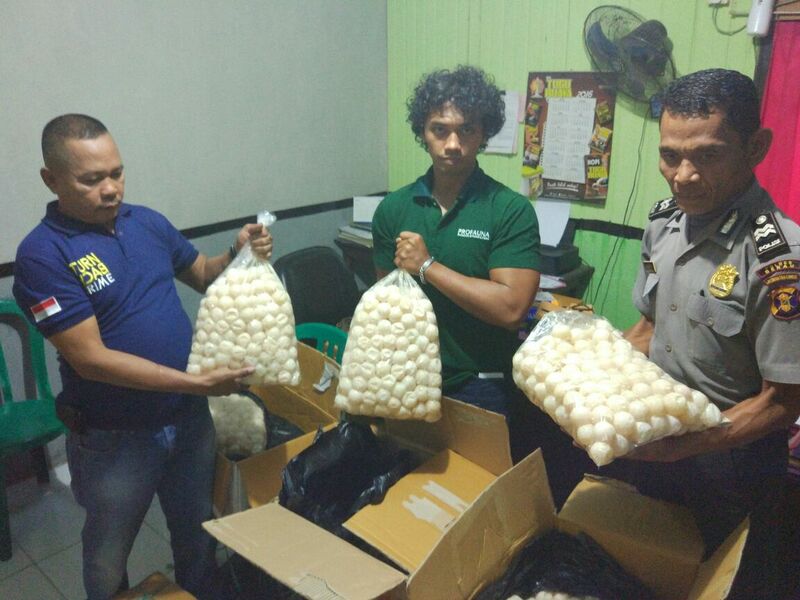 "On Friday evening (26/8), Tanjung Redeb Police Department thwarted a poaching and smuggling attempt of 4,600 sea turtle eggs, which is a fantastic number. That is why PROFAUNA highly appreciate this achievement," said Bayu Sandi, the coordicator of PROFAUNA Borneo. "The discovery is a good step towards conservation because we have been conducting monitoring, investigation, and education across berau Regency. Law enforcement effort is vital, because no preventive act would be effective without it," added him. The raid took place at Jalan Andika, Tanjung Redeb, Berau, East Kalimantan, and was a follow up of information received from local people who suspected that over six boxes of sea turtle eggs were going to be smuggled. Upon checking the reported location, the Police caught one suspect, WS, packing 4,600 sea turtle eggs to plastic bags, before adding more wraps and putting them all together in a carton box. "We went down to the police station to count the eggs, there were 4,600 eggs. The evidence and suspect are being held by the police," explained Bayu Sandi. PROFAUNA Borneo demanded that the police investigate this case further and coordinate with the court and other concerned institutions, so that only few samples of the eggs would be taken as evidence while the rest can be returned to the habitat in hope that some of them might still hatch. "We urge the police to immediately process this case, and that they would hand over most of the eggs to be returned to the natural habitat although we know that the possibility of hatching is small," claimed Bayu. PROFAUNA also expect that the criminal would be given maximum sentence as stated in the Law no.5 of 1990 concerning the Conservation of Natural Living Resources and Its Ecosystem and Government Regulation no.7 of 1999 which declares that all sea turtle species are protected. "We hope that the police enforce the law accordingly and justly. This case is a real proof that there is a criminal network exploiting sea turtles in Berau. We are aware that so far the suspect would not disclose the origin and destination of the eggs. We will follow the progress of this case," concluded Bayu.